For generations, schools have been a safe haven for our children and youth in the Commonwealth of Massachusetts and in the United States. Families trust that their children will be educated, nurtured and cared for when away from home at school-based activities. Schools have developed and adopted comprehensive emergency and disaster protocols with team approaches to preparedness, recovery, response and mitigation. Many school districts have developed outstanding collaborations with first responders and public safety to test plans through scheduled exercises and drills. Public health and community based organizations are frequently involved with schools in an “all-hazards” approach to emergency preparedness. Nationally and regionally, significant progress has been made with emergency preparedness in the wake of tragic events such as the shootings at Columbine High School, school bus accidents and other man-made or natural disasters. Yet, while many schools have readiness plans, the resources to address vulnerabilities vary widely among communities for faculty/staff and students requiring additional assistance. The Individuals Requiring Additional Assistance Preparedness Project (IRAAPP) funded by the Western Region Homeland Security Advisory Council has developed materials and trainings that address the needs of diverse and vulnerable populations in crisis situations. 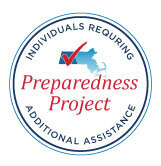 Following best practices from national models, IRAAPP in Western Massachusetts successful trained representatives from community based organizations, emergency response, disability advocates and caregivers to be ready to respond and recover from small or large-scale emergencies or disasters. Conversations with educators and other professionals who regularly interact with Individuals Requiring Additional Assistance (IRAA) in school settings, coupled with research and policy reviews revealed that school districts across Western Massachusetts have well defined emergency plans. Deficits were identified, however, with the lack of specific emergency plans for special needs students and the faculty/staff and caregivers who tend to their cognitive, behavioral, transportation and medical needs. The IRAA School Emergency Preparedness project provides guidance for school districts and caregivers to mediate these deficits. We invite you to explore the documents and manuals and to share this information with others who may benefit from these materials.